The best technology to get dry cake solids up to 40% and solids capture over 99%. The Alfa Laval Plate Press is ideal for sludge dewatering applications where very high dry cake solids are a key priority. This press can achieve dry solids up to 40%, and is easily customized to suit all dewatering and solids capture requirements. At the same time, operating costs are minimized due to very low consumption of both polymer and energy. The result is an extremely cost-efficient output of solids with dryness up to 40% and a solids capture rate greater than 99%, the highest of any dewatering technology. The Alfa Laval range of plate presses offers unrivalled quality, integrity and engineering excellence in a robust design that also includes full operator safety protection systems. An assisted cake-discharge mechanism and automatic cloth washing facilities are available on all mechanised units. The plate press is available in recessed, membrane and plate/frame versions, and the range features sidebar and overhead designs. Frames are manufactured from carbon steel, and full automation is also available. Standard feed pressures are 7, 10 and 16 bar(g), and higher-pressure units for industrial and mineral applications can be provided. First the plate press is filled with the slurry until all of the aforementioned spaces are full. Once the slurry takes up all the space in between each of the plate press chambers, valves are opened on the top and bottom corners of the filter plates to allow the filtrate (usually water) to escape as more and more slurry is pumped in. Eventually the slurry cannot be pumped in because filter cake occupies all of the spaces in between the chambers. 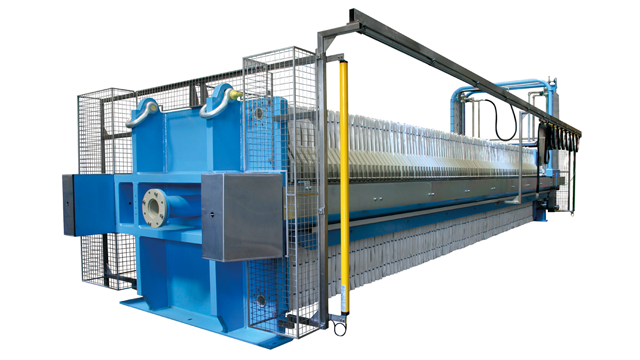 At this point the filter plates are separated either by mechanical or manual means, usually one at a time, allowing the filter cake to be discharged.